Weekends away and short breaks are the perfect excuse to indulge my passion for travel sized skincare. Does anyone else get excited about mini toothpaste or is that just me? When travelling through airports there are restrictions on liquids. Containers must hold no more than 100ml and should be in a single, transparent, resealable plastic bag, which measures approximately 20cm x 20cm (click here for UK guidelines). The rules are different if your toiletries are packed into luggage which is checked into the aircraft hold. Yes, you can easily decant your favourite skincare into smaller bottles but lets face it we all like an excuse to do a little shopping and try something new. I am planning a short break in Spain and have been browsing for pre-packaged skincare kits. As I was noting down products to buy, I thought I may as well share with you what I had my eye on. 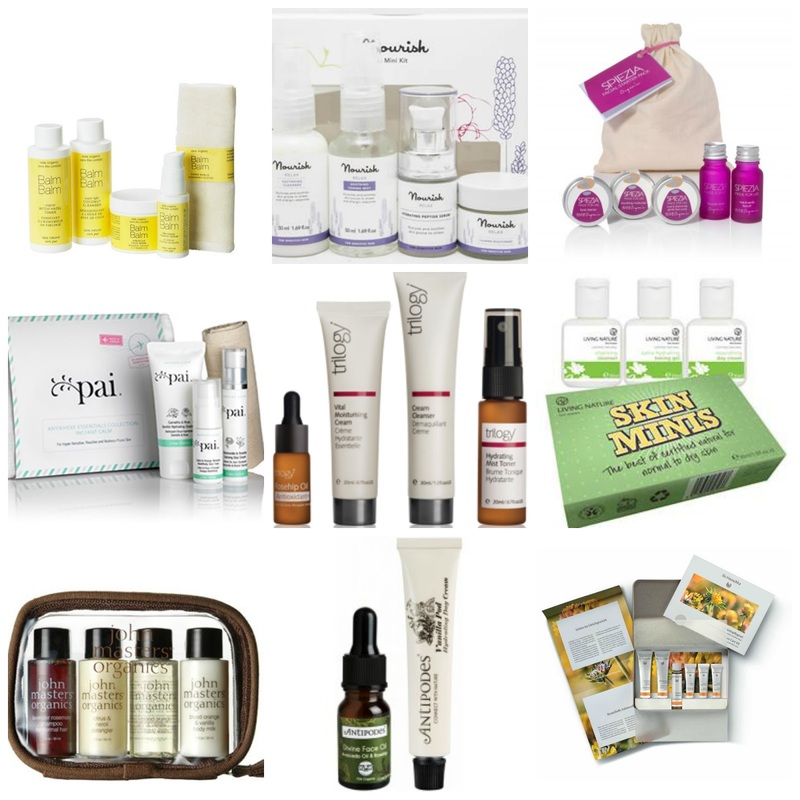 I have pictured above the following kits - Balm Balm Mini Organic Facial Kit, Nourish Mini Kits, Spiezia Organic Facial Starter Kit, Pai Essential Travel Kit, Trilogy Rosehip Collection, Living Nature Skin Minis, John Masters Organics Travel Kit, Antipodes Moisture Boost Minis and Dr. Hauschka Face Care Kit. I was asked on my YouTube channel where I buy my products. When possible I try to buy direct from brands but there are plenty of websites that specialised in natural and organic skincare. I usually start off with Love Lula*, Big Green Smile, Only Naturals and Naturisimo. Lets not forget my advertisers Vanessa’s Choice, COS natural, Sophia’s Choice (links in side bar). If you browse the Gift, Travel or Sample sections of these sites you will find some of the products I selected for this post. Also, keep an eye out for sites that sell individual samples or freebies with orders because you can put together your own personalised kit. It is stating the obvious but shop around because prices vary across websites. They all look amazing! I want to try them all hehe! Definitely agree with you on the mini toothpastes, I also really love mini shower gels for some reason! I've had my eye on a couple of these kits, particularly the Spiezia and Pai ones. I've tried that John Masters Hair kit and didn't rate it at all though unfortunately!